Many years ago I used to use TVP (textured vegetable protein) as an alternative to minced beef, it wasn't very nice really but I thought I should try it out again as things do improve over the years. I managed to find Savoury Soya Mince which I assume is the same type of thing. I made it up as per the packet instructions and found it to be a bit bland so I carried on and added a few extras from the cupboard. Potato, parsnip and sweet potato mash went on the top and the final dish turned out to be very tasty. I would use the product again. Fry the onions, carrots and celery in 1 tablespoon sunflower oil gently for about 10 minutes. Mix the savoury mince with the water as per the packet instructions and add to the pan. Add the wine, mushrooms, herbs and Oxo cube. Cover and simmer gently for 40 minutes. If it needs to be thicker continue to simmer and reduce without the lid. Add balsamic vinegar to taste. While that's all cooking, peel, chop and boil the root vegetables until cooked. Mash with a little milk and butter if you want. 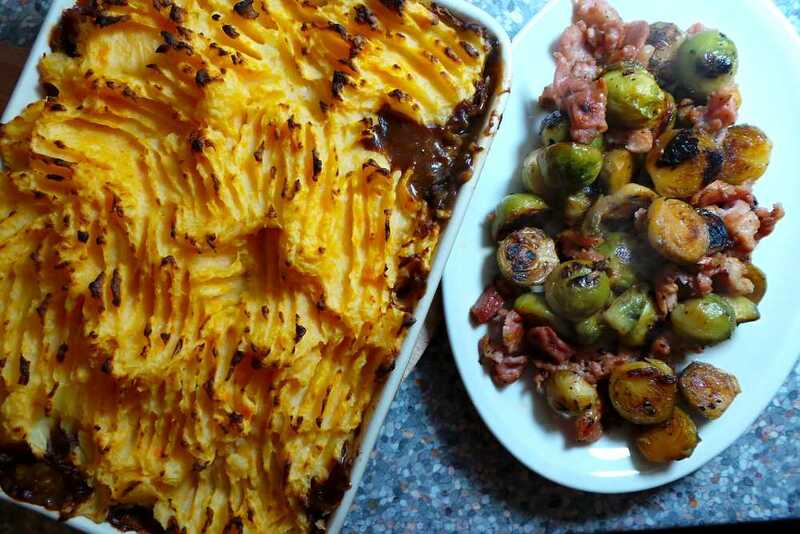 Put the thickened mince mixture into your favourite Shepherds Pie dish and top with the mashed vegetables. Cook in a pre-heated oven - 180°C - for approx. 30 minutes or until nicely browned. * I served this with brussel sprouts and bacon but any green veg is nice.